Khaled was born 3 months earlier than expected due to a car accident. This accident would leave Khaled struggling with Cerebral Palsy , while weighing 800 grams, and after being kept in the incubator for three months, the doctor realized that Khaled suffers from Quadriplegia and other visual problems. 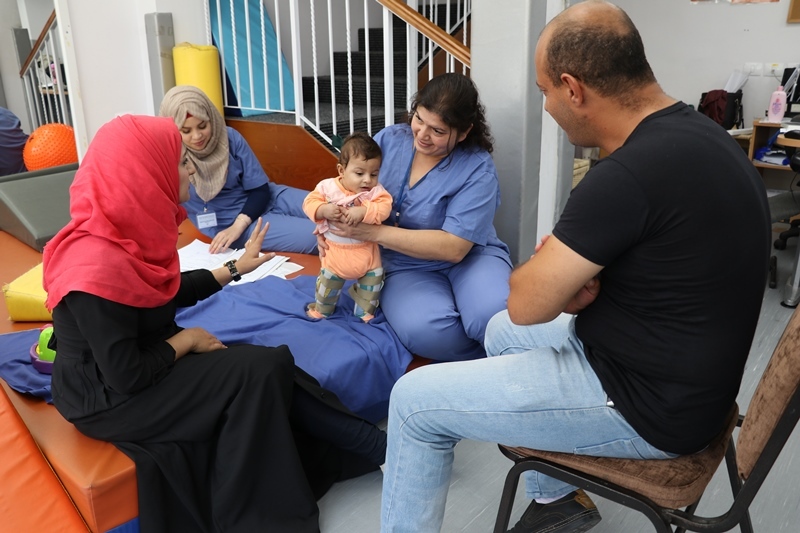 The little infant was admitted to the Jerusalem Princess Basma Centre (JPBC) after being referred by JPBC multi-disciplinary team who made their monthly visit to an intermediate Centre through the Outreach Program. Khaled’s mother “Mirveen” accompanying her child was automatically enrolled in the Mother Empowerment PPogram. “Khaled developed a lot during his three weeks stay at the Centre, where he received comprehensive therapeutic rehabilitation sessions. Mirveen happily expressed: “I witnessed a huge shift with Khaled, and I am looking forward to perform all what I’ve learnt with the therapists according to the customized home plan. Khaled started to eat different kinds of food and began to get used to his surroundings in a better way. Now, he can open his palms completely; something that he couldn’t do besides my frequent attempts. I feel that Khaled is being more flexible in his moves. Iman Ghosheh, the Rehabilitation Services Coordinator remarked about the Mother Empowerment Program that: “…it is no longer about mothers of children with disabilities. As a matter of fact, the program targets the whole family; especially the fathers. For example, Khaled’s father attended some of the therapy sessions and was trained just like his wife. This is considered as an added-value to the Program and a significant change in the culture of the fathers towards taking care of their child with disability”, Iman concluded. On behalf of all staff at the Jerusalem Princess Basma Centre, we -at JPBC- extend our appreciation to the Canadian Government for their generous support to the Mother Empowerment Program.